With Hurricane Matthew and other challenges, 2016 has been a year of ups and downs for us at GOALS, but now is a time to share some of the best news we've had all year. Introducing the very bright future leadership of GOALS, our new Country Director, James Louis-Charles! 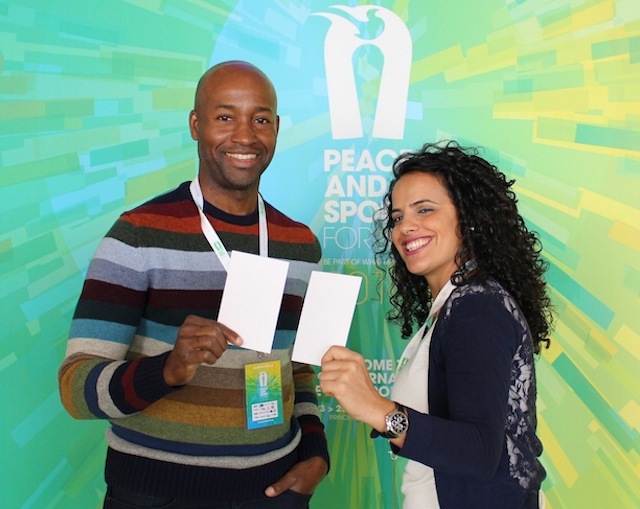 James is a coach and educator who holds an MA in Sustainable Peace through Sport from United Nations University for Peace and the International University of Monaco, and, as a long-time fan of our work, he jumped at the opportunity to join Team GOALS! With an introduction like that, you can imagine that we were only too happy to have him on board! James comes to GOALS as a Haitian-American mid-career professional who has long held a dream of returning to his home country to help youth develop through sport and, more specifically, his dream is to further the potential that soccer has to transform Haiti. "I'm a strong believer in training our coaches by working with organizations such as Coaches Across Continents to provide specific training for social issues such as gender equality and to have the strongest impact possible on our kids. Discipline and goal-setting and all social messages start with our coaches, who are role models in their communities." At GOALS, we've always believed in investing in our local coaches who are both change-agents in their communities and GOALS' biggest cheerleaders. We're thrilled that James will help us take it to the next level. Besides mentoring our coaches, James' favorite part of GOALS so far has been seeing the impact that our programs have for our kids and knowing how much they anticipate GOALS each day: "For GOALS kids, this is the highlight of their day. They don't have electricity to watch TV or play video games, and they'll even play barefoot if they don't have equipment, which just shows the importance of soccer in their life." James has already been bringing some incredible changes to GOALS and has been leading our response to Hurricane Matthew. This week, he's at the International Forum on Peace and Sport in Monaco, where he was invited to give a presentation about GOALS. All of us at GOALS, from our coaches and kids to our board and staff, couldn't be prouder to have him on Team GOALS and representing GOALS to the world at the Peace and Sport Forum. Byenvini, James! Welcome to team GOALS! Meet the rest of GOALS' staff here.